Visual templates are great tools for gathering content in an organized way. After just a little instruction, a facilitator can get out of the way and let participants populate templates on their own. Visual templates work well in any group size. With some quiet reflection, individuals can use visual templates to capture their own inner thoughts and ideas. Visual templates can provide structure to journaling. They’re a great activity to follow guided imagery or mindfulness meditation. In coaching pairs, one participant shares their ideas, the other plays the role of scribe and interviewer. This way, the coachee can focus entirely on forming their ideas, and the coach can practice active listening and questioning skills. Coaching pairs work well when the topic is personal. When the topic is less personal and reflective, pairs can use visual templates to work collaboratively, building on each other’s ideas at the same time. 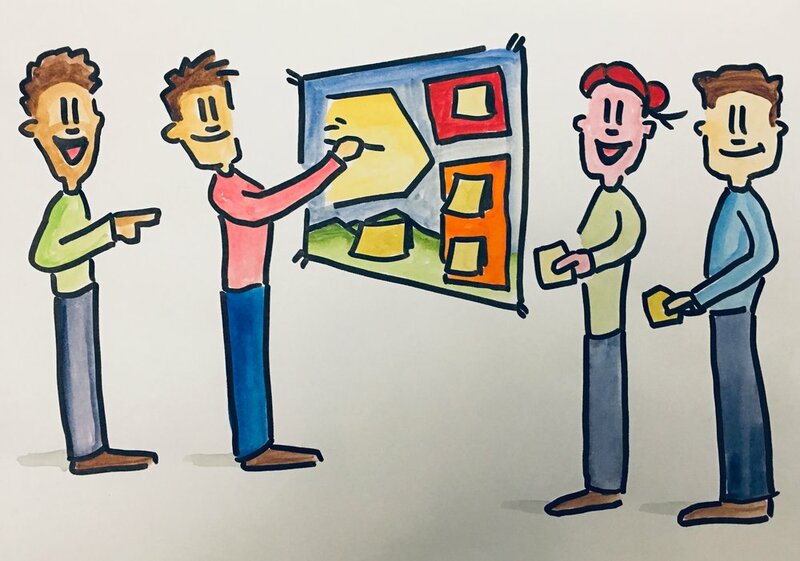 When small groups use visual templates, have one person play the role of scribe or have participants write their ideas on sticky notes and post them on the template. Have participants use Super Sticky Post-its (so they don’t curl when the template is rolled) and write with fine point Sharpies so they can be read when photographed. In the large group, use a large wall-sized template so everyone can see. Harvest ideas by assigning one or more scribes, or by having participants use stickies and Sharpies. Visual templates are a great way to synthesize ideas across different group sizes. For example, have consulting pairs synthesize their ideas together one 11”x17” template. Then, have small groups synthesize their ideas on to a small wall chart. Finally, have groups report out and capture all their on a large wall chart.